Steinberg’s UR-Series interfaces have been around for a few years now, with their higher end units paving the way for the now ubiquitous UR22. I’ve had some students and clients working with the UR22 in the last couple of years, several of them having switched from other brands of interface which were having constant driver problems on Windows 7. In my own experiences, the UR22 proved to be solid, dependable and trouble-free, so I have recommended them to a lot of other people over the years since their introduction. Steinberg have now added to their range with the UR44, which is a six input, four output interface, with a few extra DSP and software bells and whistles to entice even the more experienced computer music maker. As is the case with the UR22, the larger 44 is housed in a solid metal case, with a clean, no-nonsense look and feel. 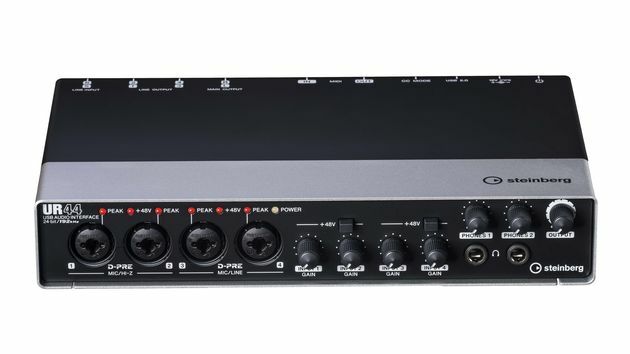 The four inputs on the front of the unit are Yamaha’s Class-A ‘D-Pre’ microphone preamps and feature the Neutrik-style combi connector (this adds to the versatility of the unit for those using a variety of instruments). Each input has its own gain control and peak indicator, plus a +48V switch for pairs 1/2 and 3/4. The front panel also features two headphone outputs with individual level control and the main output level. Usually, preamps use one transistor each for the hot and cold signals at the input stage to amplify the signal. 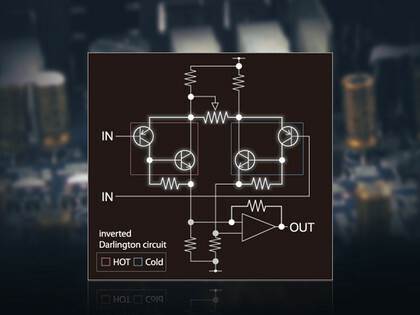 However, the D-PREs specified on Steinberg audio interfaces use an inverted Darlington circuit, where two transistors are used for each hot and cold — a total of four per unit. With only one transistor on a preamp circuit, distortion tends to increase along with the signal level. By using a pair of two cascaded transistors, very low distortion can be maintained regardless of signal level. On the back of the unit there are inputs 5 & 6 as TRS connectors, the main stereo outputs, and four individual outputs. A USB 2.0 port and, I’m happy to report, MIDI in and out plugs complete the connectivity (too many units omit the MIDI these days, and there are so many older MIDI synths out there that don’t have USB). Finally a CC Mode switch which gives class compliance for iPad connection, a security point, and the input for PSU and on/off switch. Inside, the UR44 comes with the same DSP chip that Steinberg include in their larger UR28M and UR824, giving the user extra functionality, and access to some great sounding effects. If you use Cubase, project templates for direct access to the power of the DSP are installed with the Tools installer. If you use another DAW, you have access to the UR44’s charms via the dspMixFx software utility included. Bundled with the UR44 are the Cubase AI software, dspMix control panel, and VST3 versions of the DSP built-in to the UR44: the Sweet Spot Morphing Channel Strip, the REV-X reverb, and Guitar Amp Classics. The Sweet Spot Morphing Channel Strip consists of a sidechain-enabled compressor and a three-band parametric equaliser. The great feature of this plug-in is the ‘morph knob’, which allows a smooth transition between both EQ and compression settings in combination to produce the ideal processing for your sound with just one control. Simple. If you’re feeling a more conventional approach is needed you can access all of the individual parameters as well. Guitar Amp Classics utilises Yamaha’s VCM (Virtual Circuit Modelling) techniques developed by Toshi Kunimoto and his team (as do the other excellent effects from Yamaha’s range). Four different amp types are available with a choice of CLEAN, CRUNCH, DRIVE and LEAD, all giving interesting results with a guitar or any other device that needed some ‘dirt’. The REV-X algorithms were first introduced in Yamaha’s SPX2000 multi effect unit in 2003, and were again utilised in their digital consoles such as the DM2000 and 02R96. As with all of the other software elements in the bundle, the REV-X was a breeze to use and gave outstanding, and very musical, results. 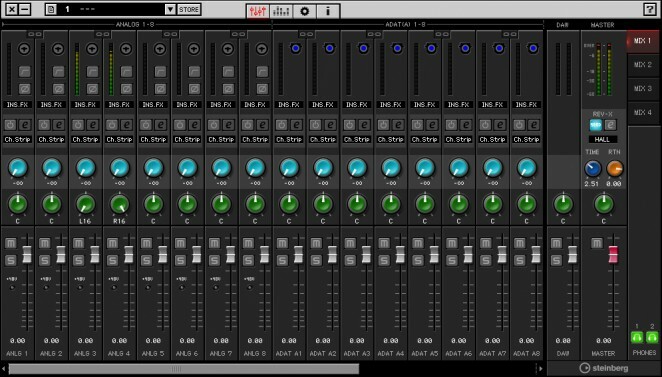 The user interface is particularly cool, with the ability to drag reverb parameters for quick trial and error. 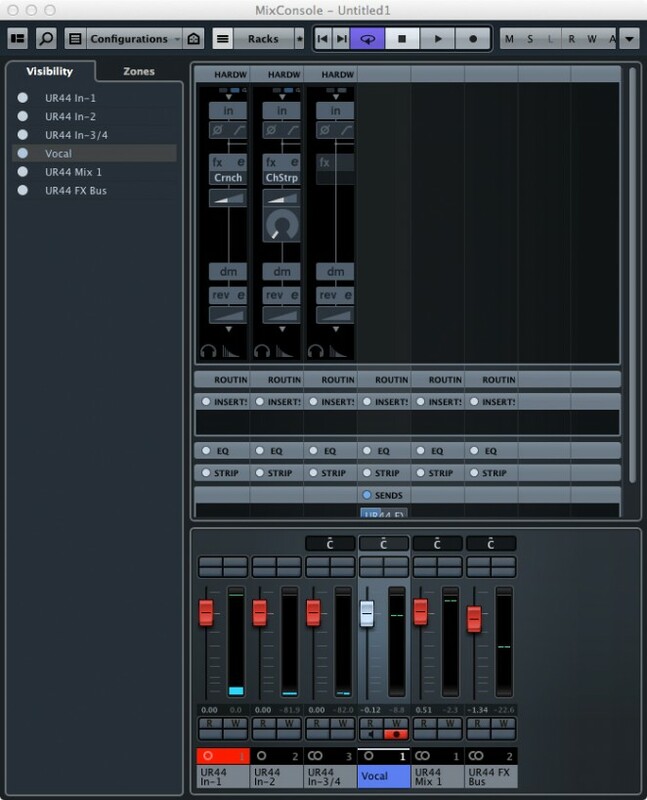 It features three types of reverb effects: Hall, Room and Plate simulations with reverb time and level control. I wanted to take the opportunity to test the UR44 to its preamplifier capacity by running four condenser microphones simultaneously, which is important in a portable recording system, especially if you are capturing instrumental ensembles or vocal groups. I see various interfaces on offer and wonder if they will provide enough phantom power to really let the preamps do the job. The results were very pleasing, with a transparent and detailed recording captured on all four channels i.e. the D-Pre’s sound real good. The DSP effects of the UR44 can be used in your recording process, either for monitoring or as part of the final recording and also sent to the headphones, and the dspMixFx software allows this with latency-free monitoring in any DAW. If you are using Cubase, the Tools installer adds a selection of song templates which can be chosen when you start a new song. These give you channel strips in the mixer for utilising the DSP effects, dependent on what template you have selected i.e. 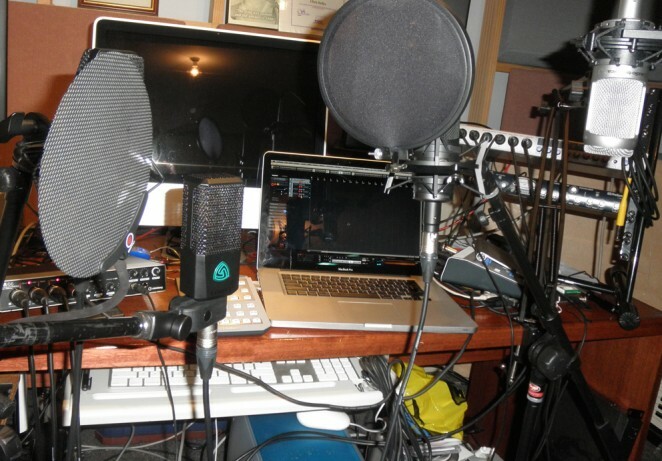 ‘vocal & guitar’ recording, etc. 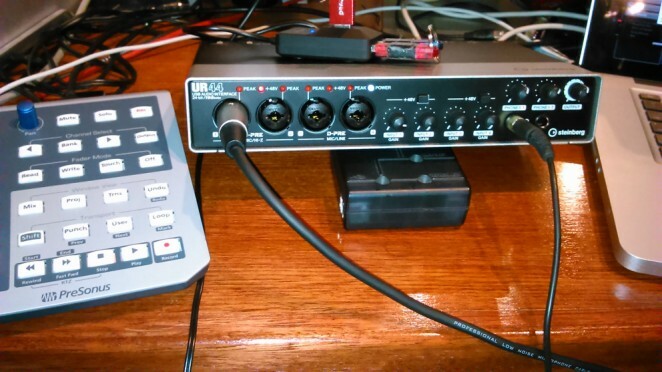 My normal setup includes a Firewire interface, but the UR44 integrated into the system without a hitch, and the bundled plug-ins were a joy to use – it was certainly nice to work with Rev-X again, as it’s so easy to get a nice reverb sound. I took the opportunity to try the UR44 with a couple of other DAWs, Bitwig Studio and Presonus Studio One, and these, as expected, worked without a hitch. 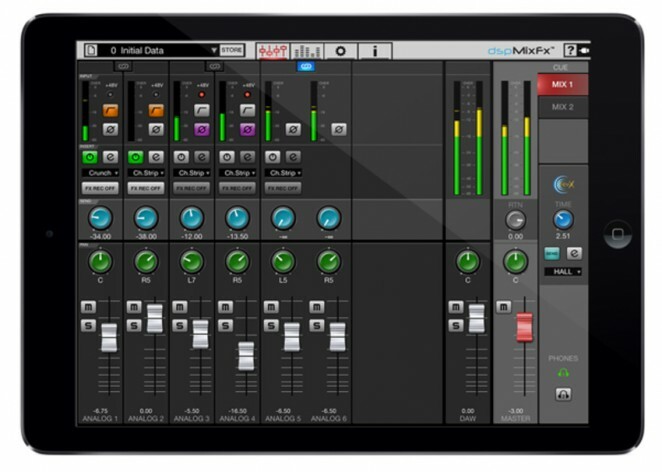 Having the iPad connectivity, via the CC switch on the rear panel, is a convenient option, as the unit will work with pretty much any iOS audio apps. My only complaint in this review (and I think I’m being pretty broad minded here), is the use of terminology such as ‘fully mobile recording solution’. For a recording device to be ‘truly mobile’, as long as there is a convenient wall with an electrical power outlet available, seems to be something of a contradiction. A UR22 (USB bus powered) with a laptop is a mobile recording solution, while anything that needs to be plugged in is not. Rant concluded. Some product reviews end up becoming tedious and difficult to get through during the writing process, while others make you want to keep researching to find out more about the background of the product and its creators. The UR44 definitely falls into the latter category. 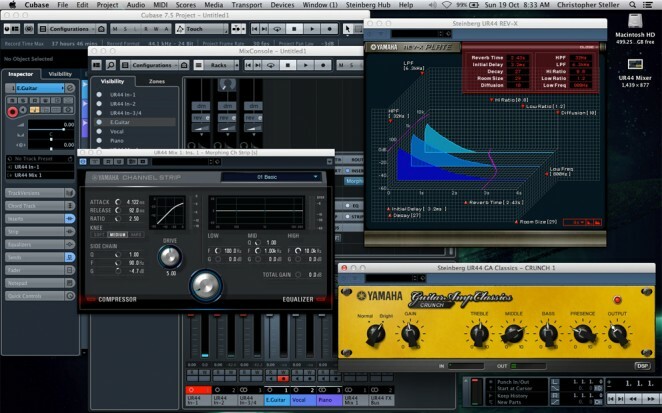 A solid, dependable product that gave tremendous recording results……and those plug-ins. A brilliant package!